Although under great time pressure due to urgent family obligations, I was able to connect the IC-7700 to my Cushcraft R8 vertical, power it up and spend a half-hour or so trying it out. The IC-7700 has the refined overall finish and feel of a first-class test instrument from HP or R&S. The receiver is extremely quiet; with no antenna connected, the internal noise was barely audible and the scope grass was just above the baseline. I was able to hear a weak 18 MHz SSB station with an excellent SNR, even though the signal was not moving the S-meter. I tried out the roofing-filter selections, NB, NR, auto/manual notch, preamps and Digi-Sel and found them very effective at a quick trial. 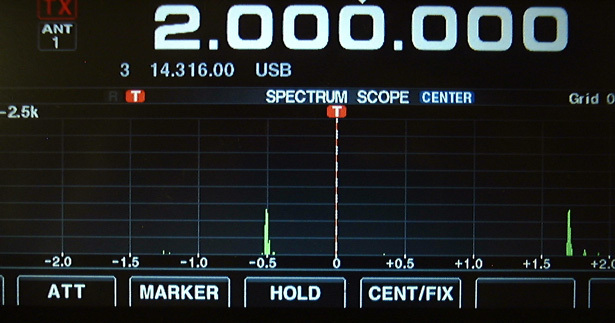 The spectrum scope is the best I have ever seen on a transceiver. I tuned in WWV on 15 MHz with the scope at ±2.5 kHz span and slow sweep. I was able to confirm Matt KK5DR's minimum 100 Hz RBW measurement; the two sidebands of the 1 kHz modulating signal stood out as sharply as on a good spectrum analyser. The grass level was right at the baseline. On Monday Sept. 1, I installed the IC-7700 in my station, wired it up to the Quadra, set up the ALC and was then QRV! My 7700 was shipped at firmware rev. level 1.03. I enjoyed a nice round-table QSO with some stations in California, Colorado and Oregon on 40m. Was on 40m SSB for a good couple of hours.The 7700, with its powerful DSP NR and NB, is very comfortable pulling weak, noisy signals out of the mess. It does this job better than the Pro3. Not only does the 7700 sound excellent on transmit and receive; its overall performance and operating "feel" are superb. It makes short work of the band noise on 40m. This shows that the NR and DSP NB in the 7700 are much superior to the NR and analogue NB of the Pro3. By means of comparative 7700/Pro3 listening tests on 40m at night, I have found that the DSP NB and NR in the 7700 do a noticeably better job of quieting down the electrical power-line noise. In one instance, I was able to eliminate intractable electrical line noise on 40m by increasing NB Width to 85, and setting the front-panel NB control at 3 o'clock. This NB setting reduced the idle-channel S-meter reading from S4 to S1 (Preamp off). With NR at 60%, the noise level at the speaker fell sharply. The NB impulse response test below tends to confirm the IC-7700's excellent NB performance in on-air operation. NB Demo (July 2009): These sound clips were captured on 20m SSB, in the presence of power-line noise at S9 + 10 dB, with the Noise Blanker OFF and ON. I find that I can pull weak SSB signals out of the noise more easily on the 7700 than on the Pro3. The 7700's much more powerful DSP also yields greatly superior IF filter performance - steeper skirts and better shape factors. The 7700's Manual Notch, with 3 width settings (WIDE-MID-NAR), can be used to "sharpen up" the flank of the passband. This can enhance a weak signal in some situations. On Sunday morning I was listening to some stations on 20m SSB. The Manual Notch (WIDE) completely suppressed the cable-TV spur near the Icom Net frequency (14316 kHz); the superiority to the Pro3 Manual Notch was quite evident. The band noise was much lower - on the spectrum scope and in the speaker. With Preamp off, the scope "grass" level was at baseline with 5 kHz span selected, and S1 - S2 signals "leapt out" and were easy to copy. Again, this is a big improvement over the Pro3. When switched in, Preamps 1 and 2 raise the audible noise level in the receiver (and the scope "grass" level) significantly less than in the Pro3. It is evident that in the 7700, the preamps have been designed for highly linear large-signal handling, consistent with a low noise figure. I have not yet encountered a situation in which the Digi-Sel preselector had a noticeable effect, but noted that the front-panel Digi-Sel control detunes the preselector sufficiently to cause observable signal loss at the ends of its range. I have selected the 6 kHz roofing filter as the default for SSB. The PA standing current on my IC-7700 is 2.8 - 3A on start-up, rising slightly as the radio warms up. I am not concerned, but this does seem a bit on the high side as compared to my Quadra amplifier which uses 8 MRF150's with Vdd = 48V. Standing Id on the Quadra is approx. 2A. This suggests that the operating point of the IC-7700 PA is a little closer to Class A, for lower IMD. I use my Heil GoldLine GM-5 and Icom SP-20 with the IC-7700. Transmit audio settings are as given in the table, with 6 dB compression on voice peaks. The settings used with the Pro3 also work fine with the 7700. The mic is plugged directly into the front-panel MIC socket; to my way of thinking, the IC-7700's transmit audio management features (which are all in the digital domain) obviate the need for external analogue audio "boxes" with their potential for added noise/distortion and unpleasant EMC surprises. Here is a view of my new shack setup. I left the handles on my 7700, and there they will stay. They enable me to manoeuvre the radio more easily on the table. The main tuning knob with its separate rubber grip is a bit of a pain; a knob with the ring already in place, and a hole in the grip allowing access to the set-screw would have made more sense. The interface with the Quadra amplifier is seamless, and works 100%. The ALC setting on the Quadra for 1 kW output is 5 bars - the same as for the Pro3. At this setting, the IC-7700 delivers 65W drive to the Quadra. The DRIVE control is set for a 50% reading on the radio's ALC scale. As is the case for all other Icom HF transceivers, the IC-7700's rear-panel ALC jack is compatible with a negative-going ALC voltage in the range 0 to -4V. Positive voltage should never be applied to the ALC jack. The IC-7700 has rear-panel RX OUT and RX IN BNC sockets. These allow the insertion of an external preselector, multicoupler or other accessory into the receiver's input signal path. As these sockets can be disabled via menu, no U-link need be connected between them when they are not in use. The IC-7700's TFT display is simply breathtaking. The screen image is expansively large, bright and pin-sharp, the contrast and colour saturation are excellent and the colour adjustment menus offer many possibilities. The standard meter display emulates a moving-coil meter to perfection, right down to the ballistics and pointer shadow! I shall comment more on the display as the review develops. The overall feel of the radio calls to mind a first-class test instrument. Unlike the Pro3 scope which has a fixed 1 kHz resolution bandwidth (RBW), the IC-7700 scope offers variable RBW in the range 100 Hz to 3 kHz. The optimum RBW value is automatically selected for each span and sweep speed setting. In CENTER mode, at ± 2.5 kHz span and SLOW sweep speed, 100 Hz RBW is selected. This allows a clear display of IMD products and AM sidebands, for example. At the narrower RBW settings, the "grass" level in the absence of signals is at or near baseline. Weak-signal spikes are thus clearly visible. I heard a strong PSK31 signal on 7071 kHz and tuned it in easily in a few seconds with the IC-7700's vector diagram and AFC. It was a local amateur of my acquaintance, so I plugged a USB keyboard and was instantly QRV. We chatted back and forth for about a half-hour at 15W RF output. PSK31 is simplicity itself with the IC-7700's PSK facility. The vector diagram, FFT scope and waterfall display to the right of the encode/decode text field greatly facilitate correct tuning. I plan to work some weak PSK31 stations, and will report the results here. Although I am a complete newcomer to amateur HF RTTY operation, I had no trouble tuning in and decoding RTTY signals during a recent contest. The familiar tuning-bar display, together with the FFT scope and waterfall display to the right of the encode/decode text field, make correct tuning very easy. The squelch can be set to mute the audio in the absence of a received signal; this is especially useful when using the Twin Peak Filter (TPF), which raises the idle-channel audio level. As for PSK, I plan to work some weak RTTY stations, and will report back here. * Sinadder 3 set to "SINAD" for Test 5, and to "AC Volts" for all other tests. For Test 3, the following test setup was used: Marconi 2018A and 2019 signal generators, each driving a Mini-Circuits ZHL-32A amplifier. Each amplifier output was connected via a 15 MHz LPF and a 20 dB pad to one input of a Mini-Circuits ZSC-2-1B combiner. The combiner input was routed via a 0-110 dB step attenuator to the IC-7700 ANT1 input. 1. MDS (Minimum Discernible Signal). In this test, MDS is defined as the RF input power which yields 3 dB unweighted (S+N)/N at the output. The results obtained are very close to those in Ref.2. Table 1a shows the effect of the 6 and 3 kHz roofing filters on MDS; these filters have higher insertion loss than the 15 kHz filter. 2. Reciprocal Mixing Noise. Reciprocal mixing occurs in a superheterodyne receiver when the noise sidebands of the local oscillator (LO) mix with strong signals close in frequency to the wanted signal, producing unwanted noise products at the intermediate frequency and degrading the receiver sensitivity. Reciprocal mixing noise is a measure of LO spectral purity. In this test, a strong "undesired" signal is injected into the receiver's RF input at a fixed offset from the operating frequency. The RF input power is increased until the receiver noise floor increases by 3 dB. The reciprocal mixing noise parameter, expressed as a figure of merit, is the difference between this RF input power and measured MDS (factoring in ΔMDS, per Table 1a.) The test is run with the 2.4 kHz SSB filter selected, and preamp off. The higher the value, the better. 3. Two-Tone MD3 (IFSS, Interference-Free Signal Strength). tested in CW mode (500 Hz), ATT = 0 dB. Test frequencies: f1 = 14100 kHz, f2 = 14102 kHz. IMD3 products: 14098/14104 kHz. IMD3 product level was measured as absolute power in a 500 Hz detection bandwidth at various test-signal power levels, with 12 dB ATT selected. The ITU-R P-372.1 band noise levels for typical urban and rural environments are shown as datum lines. Fig.1: IC-7700 2-tone IMD3 (IFSS) vs. test signal level. Note on 2-tone IMD3 test: This is a new data presentation format in which the amplitude relationship of the actual IMD3 products to typical band-noise levels is shown, rather than the more traditional DR3 (3rd-order IMD dynamic range) or SFDR (spurious-free dynamic range). The reason for this is that in a direct-sampling SDR receiver employing an ADC, SFDR referred to input power rises with increasing input level, reaching a well-defined peak (“sweet spot”) and then falling off. In a conventional receiver, SFDR falls with increasing input power. If the IMD3 products fall below the band-noise level at the operating site, they will generally not interfere with desired signals. The SFDR behaviour of an ADC invalidates the traditional DR3 test for a direct-sampling SDR receiver. Our goal here is to find an approach to SFDR testing which holds equally for SDR and legacy receiver architecture. See Reference 5. This test has been run on the IC-7700 with 12 dB RF attenuation inserted. The reason for this is that it allows direct comparison of IFSS for a legacy receiver and a direct-sampling SDR by bringing the conventional receiver's noise figure into line with that of the SDR. 4. DSP-IF filter shape factors. A quick check of -6/-60 dB shape factors was performed for the 2.4 kHz SSB, 500 Hz CW and 250 Hz CW IF filter settings. (Note: BPF Indicator was on for CW filters.) Shape factors for all 3 filter settings met or exceeded Icom's advertised specifications. The measured -6/-60 dB shape factor for the 2.4 kHz SSB filter was 1.24; the spec is 1.5. 5. SHARP vs. SOFT SSB filter roll-off. Test conditions: 10.000 MHz LSB, 2.4 kHz filter selected, RF input power -96 dBm (below AGC threshold), AGC off, preamp off, ATT = 0, NR off, NB off, Twin PBT neutral. Table 3 shows the roll-off for the [SHARP] and [SOFT] filter settings. 6. NR noise reduction, measured as SINAD. This test was intended to measure noise reduction on SSB signals close to the noise level. Initial test conditions: Sinadder configured for SINAD measurement. 10.000 MHz LSB, 2.4 kHz filter selected, AGC MID, preamp off, ATT = 0 dB, NR off, NB off, Twin PBT neutral. This shows an S/N improvement of 10 dB with NR at maximum for an SSB signal roughly 6 dB above noise level. This is an approximate measurement, as the amount of noise reduction is dependent on the original signal-to-noise ratio. 7. Manual Notch Stopband Attenuation. Test signal: -72 dBm (≈ S9) at 10.100 MHz CW. NR off, NB off, 500 Hz CW filter selected, Preamp 2 on. Manual Notch set to MN/NAR. Measured MDS: -142 dBm. The Manual Notch nulled out the signal completely. Thus, Manual Notch stopband attenuation is at least 70 dB. 8. Manual Notch Bandwidth. Dave, KI4KQ, has been kind enough to contribute the results of his Manual Notch bandwidth test. The AGC recovers completely during the preset decay time; there is no evidence of clamping. This is evident from a sound file captured during the test. (The 1 kHz tone is due to signal leakage through the HP 8640B's pulse gate.) View a screenshot of the test. 9b. Test with pulse trains. Here, the HP 8011A is coupled to ANT4 via the pick-off port of a line sampler. The sampler's main port is terminated in 50Ω. The IC-7700 is tuned to 2 MHz, as the RF spectral distribution of the test pulse train has a strong peak in that band. AGC decay time is set to minimum (0.1S) as before, but Preamp 2 is on. As in Test 8a, the AGC recovers completely during the preset decay time; there is no evidence of clamping. This is evident from sound files for the 70 nS and 125 nS cases. View a screenshot of the test. 10. NB Impulse Response. As the IC-7700's noise blanker is a DSP process "upstream" of the AGC derivation point, the NB should be very effective in suppressing impulsive RF events before they can stimulate the AGC. To verify this, the NB is turned on during Test 8A. The NB parameters (Threshold, Depth and Width) are adjusted for best suppression of the test pulses. (Ref. 3, p. 5-16). Table 6 gives the results. A sound file is available for the 125 nS case, the pulse is barely audible. The S-meter deflection is also completely suppressed in both cases, showing that the impulsive events never reach the AGC derivation point. The NB also suppresses isolated single events. This can be verified by selecting PULSE PERIOD/EXT and pressing SINGLE PULSE on the HP 8011A. 11a. Spectrum Scope Amplitude Linearity.The spectrum scope dynamic range is 80 dB (Scope ATT = 0 dB). The scope graticule has 8 vertical divisions at 10 dB/div. In this test, SPAN is also set to ± 2.5 kHz, with SLOW sweep. The vertical amplitude is noted for each 10 dB increase above the minimum visible spike. The scope display tracks the input signal power accurately over the entire 80 dB range. 12. Spectrum Scope Resolution Bandwidth. In a spectrum analyser, the resolution bandwidth (RBW) determines how far apart in frequency two (or more) signals must be to be resolved into separate and distinct displays on the screen. Note: From the foregoing, it will be seen that the IC-7700 is also useful as a bench spectrum analyser. 13. S-Meter Tracking and AGC Threshold. This is a quick check of S-meter signal level tracking. Initial IC-7700 settings: 2.4 kHz USB, Preamp off, 15 kHz roofing filter, AGC SLOW. To measure AGC threshold, the HP 8640B is offset -1 kHz to produce a test tone in the speaker. The RF output is turned down to MDS. 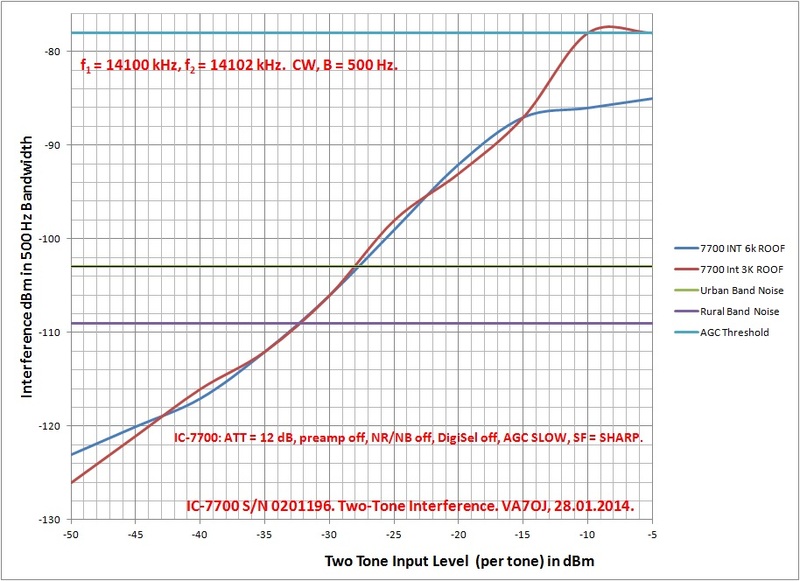 The IC-7700 AF Gain control is adjusted for -6 dBr test tone level. The input signal power is then increased until the test tone no longer increases. The test is then repeated with AGC OFF. The actual AGC threshold (knee) is the point at which the AGC OFF test tone level first exceeds that for AGC SLOW. Table 9: S-Meter Tracking & AGC Threshold. Preamp 1: S9 = -83 dBm. Preamp 2: S9 = -90 dBm. Measured AGC Threshold (Preamp OFF): -90 dBm. 14. DIGI-SEL Insertion Gain & Bandwidth. This is a simple test to determine the gain of the DIGI-SEL preselector at its centre frequency, and its -6 dB bandwidth. Initial IC-7700 settings: 2.4 kHz USB, Preamp off, DIGI-SEL off, DIGI-SEL control at 12 o'clock, AGC SLOW. Spectrum scope SPAN is set to ± 5 kHz, with SLOW sweep in CENT mode. A 14.100 MHz test signal at approx. -70 dBm is applied to the antenna input and adjusted for +40 dB vertical amplitude on the spectrum scope. DIGI-SEL is then activated and the signal-generator output reduced to restore the vertical amplitude to + 40 dB. Here, the required reduction is 2 dB, indicating 2 dB DIGI-SEL insertion gain. *This is checked by increasing the signal-generator output by 6 dB and noting that the scope again reads +40 dB. 14a. DIGI-SEL passband spectrograms. A NoiseCom NC6110 RF noise generator applies a broadband noise spectrum at a power spectral density of -91 dBm/Hz to the ANT 1 input. Initial IC-7700 settings: fo = 14.100 MHz, 2.4 kHz SSB, Preamp off, DIGI-SEL off, DIGI-SEL control at 12 o'clock, AGC SLOW. Spectrum scope SPAN is set to ±250 kHz, with FAST sweep in CENT mode. Fig.2 shows the resulting noise spectrum. Fig.2: Noise spectrum with Digi-Sel off. Next, Digi-Sel is activated. Fig.3 shows the resulting noise spectrum. Note the 6 dB roll-off at the -250 and +250 kHz span edges. Fig.3: Noise spectrum with Digi-Sel on. Click here for the Digi-Sel page, including additional tests. 16. Calibration Marker Leakage (September 2010). The calibration marker comb signal is applied at the inputs of the LPF's preceding the HF and 50 MHz 1st mixers. Test conditions: Calibration Marker on, Preamp off, Digi-Sel off. If you are concerned about this leakage, you can enable Preamp 1 or 2 (or Digi-Sel) whilst the marker is on. 17. Transverter Output Level (August 2014). I measured the transmit power output at the X-VERTER socket with a Millivac MV-723B broadband RF millivoltmeter terminated in 50Ω. Transverter Mode was set to ON (OTHERS menu), and the output for various RF Power control settings recorded at 28.1 MHz in RTTY mode. The DRIVE control was nominal (50%). The test results are listed in Table 11. My friend Matt KK5DR has tested IC-7700 transmitter output and 2-tone IMD. Please refer to pages 5 and 6 of his IC-7700 User Review. I downloaded Ver. 1.04 from the Icom Japan website, and installed it without difficulty. Icom's description is rather brief: Improvements in the software performance for the DSP UNIT. I noted a very subtle improvement in NR operation; the NR seems to track voice peaks a little faster and attenuate "highs" somewhat less than in ver. 1.03. In addition, the "noise tail" which I had previously observed in ver. 1.03 - a rise in background noise level on voice peaks, which trails back to silence between syllables - is much less noticeable. During a regular Sunday-morning session on 20m and 17m, I encountered bursty, rasping electrical noise at S9 + 10 dB. The noise spikes peaked at 40 - 50 dB above baseline on the Spectrum Scope. NR was at 1 o'clock, NB at 3 o'clock, NB Depth and Width at 8 and 80 respectively and Preamp 2 on. The NB took the noise out completely, dropping the idle-channel S-meter reading from S9 + 10 to approx. S3. Here is a live demo. As a mainly MW broadcast DX'er, I had a great problem with listening to AM stations in SSB/ECSS mode as the audio created loud transients of high notes that were painful to the ear, making listening in this mode difficult. In the new v1.04 upgrade this appears to be rectified, so I can now listen to AM BBC World Service on SSB/ECSS during the day during non-DX time and hear it without the previous annoying distortion. The upgrade is a significant improvement to the previous problem and does seem to solve it satisfactorily. If I now walk away from the radio for a while and come back it is not even evident I have the NR on, whereas previously it was shrieking at you and you knew it was the old NR. I never had a problem with listening to the amateur bands in SSB only, so those of you who listen only to SSB signals may not have noticed a big difference. I downloaded Ver. 1.11 from the Icom Japan website, and installed it without difficulty. Icom's description is succinct: Improvements in the TX monitor audio level. There was a marked improvement in monitor level. The monitor volume in the Heil ProSet Plus is now quite adequate with Moni Gain at 50% and AF Gain at 30%. Previously, the monitor level was marginal with Moni Gain at 75% and AF Gain at 40%. I downloaded Ver. 1.12 from the Icom Japan website, and installed it without difficulty. Icom's description is as follows: Improved DSP filter shape selection function to work correctly when changing the operation mode. There was a subtle improvement in DSP IF filter performance. Filter skirts appeared a little steeper, with less ringing, and there was a greater contrast between Sharp and Soft shape-factor selections in SSB and CW modes. These are subjective impressions; I did not perform "before-and-after" measurements. * No, Geraldine, this is not an April Fools' joke! Copyright © 2008-2010 A. Farson VA7OJ/AB4OJ. All rights reserved.